Middle Collegiate Church, 50 E 7th St. 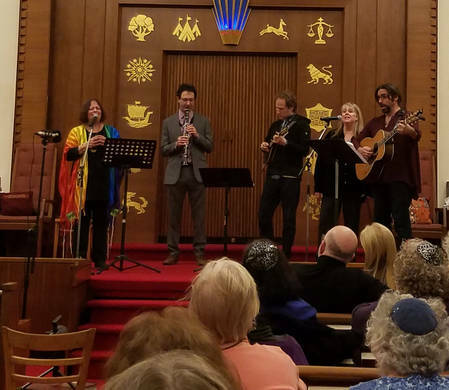 Rabbi Eva, Adam Feder and The Shul Band took part in the 2019 Spiritual Sounds gathering of Local Faith Communities of the East Village on Sunday, January 27th. It was a very moving evening of music and recitations. Here is the Affirmation Statement that was read aloud. We, the local faith communities of Jews, Muslims, Sufis, Hindus, and Buddhists stand here together before you in peace, and as one humanity. 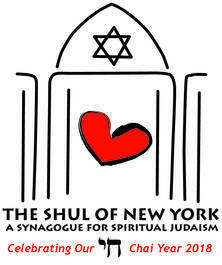 Here in the Lower East Side, with its over 250 year history of people from all corners of the world, all faiths, all languages, all cultures seeking refuge from great oppression, hatred and poverty, we have had to learn and re-teach ourselves repeatedly about the advantages of and the goodness in tolerance and respect while living side by side. Let us honor the work of those generations before us who labored together to feed, nourish, educate ourselves, build bridges, share our joys and cultural celebrations, and to establish our unique houses of worship next to each other. We gather toward healing (in times of acts of hatred and prejudice), prevention, respect and understanding, in the strength of our deep commion values. We wish to encourage and reflect the greatest shining strength of our city and our nation, the best in us, our unity and diversity.